The current Future Forests Research programme that has helped deliver the ClimbMax harvester, CutoverCam and the Alpine Carriage and has catalysed a new round of innovation in steep country harvesting, ends on 30th June of this year. Over the last 15 months an extensive round of consultation with large and small forest owners, contractors and other interested stakeholders has been undertaken by FFR to identify where the industry priorities lie and the focus for a future research programme. This has involved workshops in Rotorua, Gisborne and Balclutha to identify research themes and research projects and industry has then been asked to rank and prioritise these. Smaller groups of industry people have helped develop the framework for a new research programme. The outcome of this consultation process was support for more automation across a wider range of forest operations, from silviculture, thinning and clear felling as well as early capture of log attributes to aid subsequent log allocation and decision making. Progressing the development of a robotic tree faller building on “the stick insect” concept developed in the current programme has come through as a high priority from industry people. Improving the efficiency of supply chains by eliminating duplication of activities, such as log measurement was identified as another priority. Early capture of this information and attaching the information to the log via a tag system has the potential to streamline downstream supply chain management. An example of what the future may look like. 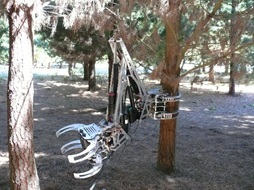 The prototype “stick insect” tree felling machine.